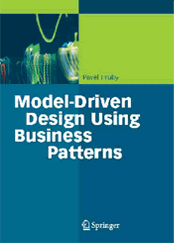 The book Model-Driven Design Using Business Patterns by Pavel Hruby, Jesper Kiehn and Christian Vibe Scheller explains REA (Resources, Events, Agents) in detail, shows how to apply it in business software applications, and presents more than 20 structural and behavioral patterns that use REA as a common backbone. An REA-based example application illustrates how to build a web shop for Joe’s Pizzeria, an REA model analyzed in the book. An aspect-based example application illustrates how to extend an REA application by various user-, application-, and branch-specific functionality using aspect patterns. Both applications require this SQL Server database. In order to compile and run the applications you need Microsoft Visual Studio 2005 and Microsoft SQL Server 2005. However, even browsing the code without actually running it will give you an idea about possible complexity of the applications that can be created using the methods described. 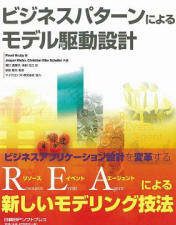 The best book on REA so far. "I came across Fowler's book and I think it was great, and I liked it so much, especially modeling the account and the related entries. But that was about it as far as the simplicity goes. It started to get a bit more complex as I started to get more patterns. I started to do some more searches till I got to the REA, Resources- Events-Agents and that was it. I was blown away. The model is so simple but powerful in capturing the most fundamental concepts in the accounting and business domain". Read the complete review here. Dave Feistein on amazon.com.